Here at J&D Furniture we intend to make your shopping experience online quick and easy. Below you’ll find a list of important headings to assist you when using our site; including terms & conditions, rules, processes and privacy statements. We strive to provide satisfaction; therefore our website is developed to ensure effortless navigation, while our staff will make every effort to assist you throughout all stages of the purchase process. Remember, your feedback is important to us and is always welcome – contact us. You will be required to accept our Terms and Conditions every time making the order, so we strongly recommend you carefully read on. J&D Furniture spent a lot of time on developing Terms & Conditions that will be clear and simple, ensuring that a customer has all necessary information. Buyer/You: means the person who buys or agrees to buy the Products from the Seller. Conditions: means the terms and conditions of sale set out in this document and any special terms and conditions agreed in writing by the Seller. Delivery date: means the date specified by the Seller when the Products are to be delivered. Products/Goods: means those goods specified. Price: means the price for the Products including packing and VAT. Seller/Us: means J&D Furniture (Registered office: Unit 11, Ballinacurra, Business Park, Midleton, co Cork. Registered in Ireland No. 9838350F). Consumer: shall bear the meaning ascribed in section 12 Unfair Contract Terms Act 1977. The prices for goods are quoted in Euro and are subject to change from time to time. All prices are stated inclusive of valued added tax (VAT) at the relevant rate at the time of purchase (currently 23%). We reserve the rights at our sole discretion to limit the number of any goods that may be purchased in any transaction or impose any purchasing limits that we may require from time to time. We promote a wide range of goods for sale via the Online Store. When you order products and services from this site, we treat this as an offer from you to purchase such products and services. If we are unable to supply you, for any reason, with a good ordered, we will inform you of this and will not process your order. Due to the large number of goods available, it is always possible that, despite our best efforts, some of the goods on offer may be incorrectly priced. If we discover an error in the price of the goods you have ordered we will inform you of this error and we will give you the option of continuing to purchase the good at the correct price or cancelling your order. We will not process your order until we have your instructions. If we are unable to contact you using the contact details you provided during the order process, we will treat the order as cancelled and notify you in writing. Please note that if the pricing error is obvious and unmistakeable, we do not have to provide the Good to you at the incorrect (lower) price. Where you have ordered products or services, your order will be accepted and an agreement concluded between us when we send you an order confirmation email or when you receive your order, whichever is earlier. Every effort is made to display as accurately as possible the colours and textures of our fabrics that appear in our stores, on our website and in other promotional materials. However, we cannot guarantee the complete accuracy of the pictures or photographs that are shown. Many conditions such as your monitor or screen settings and batching can affect the colouring of fabrics in a picture. Therefore, we do not accept returns, exchanges or complaints related to colour differentiation. The details of your purchase submitted over the internet are protected by Secure Socket Layer (SSL). We may also implement our own security procedures to prevent fraud. We reserve the right to enhance, amend and update our security procedures. Our internal security procedures include the processing of your personal and contact details. This processing takes place on a server that is not accessible on the internet. Your information is encrypted for the processing of your transaction. Notwithstanding this, you should be aware that there are certain risks associated with internet communications. You acknowledge that the internet is a media over which we have no control. J&D Furniture does not require a deposit for most online orders. However, the orders of the value greater than €3000 a 10% non-refundable deposit may be requested in order to secure your products. The buyer will be obliged to pay the full price for the goods ordered in store (in Midleton, Dublin or Galway) before the goods arrive or on delivery. The service charges, including the delivery and the disposal cost should be paid on the day and time of the delivery in cash. The buyer will be advised before confirming the order of goods of estimate delivery times, applicable delivery charges and how such delivery charges will be payable and any delivery restrictions (if any). The delivery will be to the address as specified by the buyer in the online order. Goods will be delivered on the signature of any occupant at that address at the time of delivery. Deliveries will not be made to PO Boxes or to addresses outside the Republic of Ireland. The seller will make every effort to ensure that products ordered are delivered within 6 weeks from the date of receiving the order confirmation. If we do not deliver the Goods to you within this time period, where you agree, we will deliver within an extended period of delivery. In the event of delay or non-delivery of products the buyer should immediately contact our customer representative at orders@jdfurniture.ie or else call one of the shops, who will assist you in resolving the matter. Where a contract involving the sale of goods is entered, J&D Furniture confirms it will supply these goods in conformity with that contract. 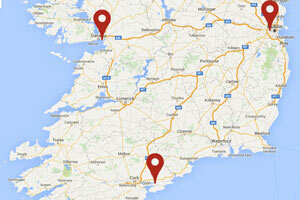 The delivery cost depends on the distance between the shipping address and our offices (in Midleton, Dublin and Galway). The buyer should check the distance and select the correct service before placing the order. J&D Furniture, at its sole discretion reserve the right to amend the distance charges accordingly if mistakes arise. The seller will inform the buyer of such a change and request a confirmation of acceptance. The seller should inform the buyer about the date and time of a delivery of goods at least 2 working days before. The buyer is responsible for ensuring that furniture and accessories ordered will fit into the desired room, as well as through doorways, stairways, elevators, and hallways. Items that do not fit into your home and are returned to J&D Furniture by the Purchaser for this reason are subject to a 10% restocking fee. The Purchaser will also be charged a new delivery fee for replacement merchandise. A return shipping fee may also apply. All purchases, with the exception of special order items, clearance items, and floor samples may be returned to our service centre within 14 days of purchase for a full refund minus original delivery or shipping fees. The original purchase receipt is required as proof of purchase. For transactions with an original receipt*: Purchase made with cash: a cash refund will be issued. Purchase made with a credit card: a credit will be issued to the original card. Original card must be present at time of return. A driver’s license, national identity card or passport may be required for identification purposes only. This is required for all returns and exchanges made in store. Merchandise exchanged for same items due for reasons other than manufacturer defects will be subject to a 10% restocking fee and re-delivery and / or shipping fees. A J&D Furniture representative may select reasonable replacements for items that have been returned under terms & conditions of warranty. All exchanges or returns, except for manufacturer defects, are subject to re-delivery and / or shipping charges. In the event that the replacement product is defective J&D furniture will refund the price of the product to the Purchaser. It is J&D Furniture that determines, at its sole discretion, what constitutes a defective product. Please note refunds may take up to 15 working days to process. No repairs under the warranty or exchange processing will be completed on upholstery or leather items unless these items are clean. If considered covered by this limited warranty, J&D Furniture through its own service operations, will then, at its sole discretion, either repair the defective product or replace it with the same or a comparable product. It is J&D Furniture that determines, at its sole discretion, what constitutes a comparable product. If it is covered by this Limited Warranty, J&D Furniture will pay the costs of repairs, spare parts, and labour for repair staff, that J&D furniture incurs, provided that the product is accessible for repair without special expenditure. This does not apply to any repair work not authorised by J&D furniture. If the product is covered by this Limited warranty repairs will be carried out free of charge at our service centre – Unit 11 Ballinacurra Business Park, Midleton, Co. Cork. With certain products we can provide an in -home repair service. It is J&D Furniture that determines, at its sole discretion what products can be repaired in the Purchaser`s home. If this service can be provided by us and the Purchaser opts for it then the charge for same is the normal J&D Furniture delivery charge. This charge will be waived for products which were delivered by J&D Furniture on purchase of same. If the item cannot be repaired to factory specifications, the item will be replaced with the same or comparable merchandise. It is J&D Furniture that determines, at its sole discretion, what constitutes a comparable product. If the same or comparable merchandise is not available, the store will issue an IN-STORE CREDIT to the Purchaser. If an in-store credit is issued the defective product must be returned to J&D Furniture. The store will not perform work or repair any furniture which may cause a hazard to our employees or our property. It is J&D Furniture that determines, at its sole discretion, what constitutes a hazard. Replaced parts become the property of J&D Furniture. The warranties are to the benefit of the original purchaser of the product. They are not transferable. The original purchase receipt is required as proof of purchase. The limited warranties do not apply to products that have been stored incorrectly, used inappropriately, abused, misused, altered, or cleaned with wrong cleaning methods or wrong cleaning products. The warranties do not cover normal wear and tear (deterioration or depreciation in the value of the products by ordinary and reasonable use), cuts or scratches, or damage caused by impacts or accidents. The warranties do not apply if products have been placed outdoors or in a humid environment or if the products have been used for non-domestic purposes (unless otherwise stated). Visible surface damage (scratches, nicks, tears, etc.) are not covered under this warranty unless reported within the first seven (7) days of delivery. J&D Furniture is not responsible for visible surface damage to product that has been picked up from our service centre unless it is noted at the original time of pick up. Any damage upon delivery must be noted on the delivery receipt. Damage not noted on delivery receipt will be determined to be customer damage, and not warranted. The warranty is VOID if the merchandise has been moved from the original delivery address or if J&D Furniture determines the furniture damage was caused by abuse, negligence, accident, or if used for purposes other than those intended, such as commercial use. These Conditions are governed by the laws of Ireland and we and you submit to the exclusive jurisdiction of Courts of Ireland. If any part of these Conditions is determined to be invalid or unenforceable pursuant to applicable law, the invalid or unenforceable provision will be deemed superseded by a valid, enforceable provision that most closely matches the intent of the original provision and the remainder of these Conditions shall remain in effect.